This article about the Bollinger B1 electric truck was first published on Gas2. Robert Bollinger says his Bollinger B1 electric truck is the culmination of a lifelong dream. Revealed last week in Manhattan at the Classic Car Club, the Bollinger B1 has all the style and grace of a Quonset hut. Overall, its looks fall somewhere between utilitarian and purposeful. Although it looks like it was carved from a solid block of diamond plate steel, it is actually constructed almost entirely of aluminum. This is an electric truck with a purpose — to go anywhere, anytime, and haul anything that will fit inside without burning one drop of fossil fuel. It makes no excuses and asks for no special considerations. It’s as tough as a truck can get and there are those who will love it for its straight-ahead dedication to getting the job — any job — done right here, right now. 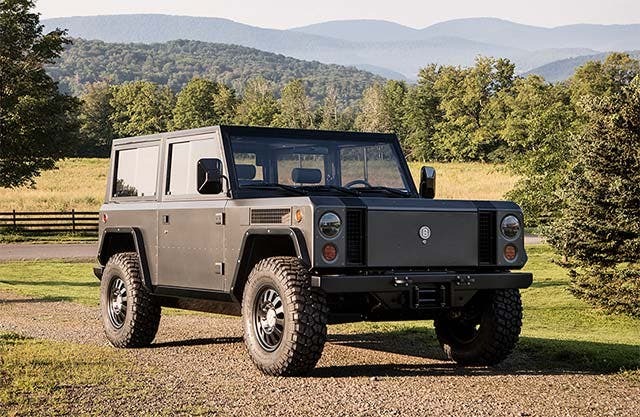 The Bollinger B1 is a sport utility with the emphasis on utility. It is designed for serious offroading with 10″ of suspension travel and dual motors for full-time four-wheel-drive capability. It is half as wide (76.5″) as it is long (150″) and stands more than 6 feet tall. “Rugged” doesn’t begin to describe the B1. Offroaders will be delighted with its 15.5″ ground clearance, approach angle of 56 degrees, departure angle of 53 degrees, and breakover angle of 33 degrees. They will also appreciate that is has a high-strength, low-alloy steel rollover structure — just in case. Stopping power is supplied by 11.75 inch vented inboard discs and four-piston calipers at each corner. Regenerative braking helps to recharge the battery during deceleration. With 360 horsepower and 472 lb-ft of torque, power on demand is guaranteed. 0 to 60 takes just 4.5 seconds and the electric truck has a top speed of 127 miles per hour. It weighs under 4,000 lbs, has a payload of 6,100 lbs, and has a gross vehicle rating of 10,001 lbs. 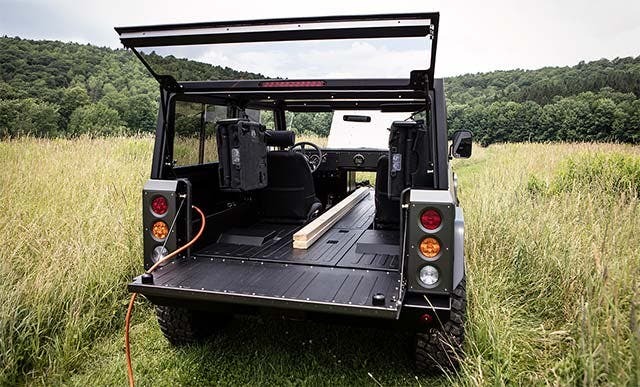 A unique feature of the B1 is a one-square-foot opening at the firewall that allows 12′ long boards to be transported completely with the enclosure of the vehicle. Two batteries will be offered. A 60 kWh pack offers 120 miles of range. A larger 100 kWh battery is good for 200 miles in range. The B1 has a J1772 universal connector for conventional 110V and 220V charging while Level 3 “DC Fast” charging is possible using the CHAdeMO protocol. Reservations are being accepted now via the Bollinger website, with production scheduled to begin in 2018. Pricing has not been announced at this time.